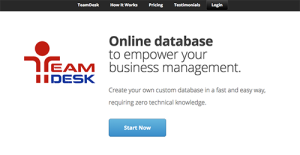 TeamDesk is a fully cloud-hosted database platform designed for users who want to create custom databases without having to hire an IT team or needing extensive technical knowledge. With this, you can easily consolidate and categorize all of the information you use for your day-to-day operations. Moreover, as it is web-based, you and your team members can access it through your computer, laptop, or smartphones, giving you better mobility. Ideal for businesses of all sizes, TeamDesk offers predefined database templates that are created depending on the functions you need as well as the requirements of your industry. These can be completely customized so you can tailor it according to your business’ changing operational needs. With this, it is easy to create a database that reinforces your workflow and company structure. Another unique aspect of TeamDesk is that it’s a pay-as-you-go service. The vendor does not offer any long-term contracts, so you only spend on the type of database solution you need for a particular phase of your business growth. TeamDesk is an online database software that enables teams to easily design web-based database applications or use predefined solutions to gather, share and manage business information. You need software that matches your business workflow, not wise versa. TeamDesk platform is completely flexible and customizable, allowing companies to build online databases that perfectly match their unique structure and requirements instead of having to adjust their business processes to match a non-adjustable workflow of some ready-made products. Each TeamDesk-based database is individually crafted to match your unique business process and it includes only necessary features and options. Each system object can be modified or built from scratch according to your company’s specific needs. Furthermore, TeamDesk web-based databases evolve with your company, so they always match your current business model in every detail. TeamDesk allows sharing your database with others, assigning each user (or user group) individual access levels to any part of the information. Custom “roles” may be created to store a unique set of permissions. By assigning appropriate roles to users, you can precisely restrict their access to any part of data and manage their permissions to perform any kind of actions. TeamDesk provides unlimited storage and allows an unlimited database complexity for no extra costs, while keeping stable rates and a straightforward pricing model for a decade. No matter how many records TeamDesk customers store or how much space their attachments take, TeamDesk rates stay flat. As TeamDesk back-end database is powered by Microsoft SQL Server, it is capable of processing a massive data volume. Some of TeamDesk customers’ databases contain as much as tens of millions of records. TeamDesk web-databases allow managing business critical information the way you want to and modify online applications any time you need to over the Internet. It is always available online for your team to collaborate. TeamDesk has been in business for over a decade with availability rating of 99.8%. What Problems Will TeamDesk Solve? There are still a lot of companies that keep using spreadsheets to hold their business data and organize their team collaboration. This approach doesn’t allow them to organize data sharing according to each user access level. TeamDesk-based databases provide a centralized environment to securely keep your business data and organize your team collaboration. In addition, TeamDesk provides a powerful role-based access mechanism. Roles allow controlling what data users have access to and which actions they can perform against the database. TeamDesk provides a variety of features to simplify routine work. For example, the Document option and Workflow triggers can be helpful to save your time and efforts. A typical business process requires creating various types of documents like invoices, contracts, project confirmations, etc. All these documents can be generated by TeamDesk, as the system dynamically populates document templates with calculated values. Workflow triggers define what actions will be triggered when a certain event occurs. For instance, an email can be sent when an order is complete, a new Status can be assigned automatically when an attachment is added, etc. Currently TeamDesk supports three types of triggers: Record Change Triggers, Time-Dependent Triggers, and Periodic Triggers. “Actions” define events that are triggered. Currently there are four types of workflow actions supported by TeamDesk: E-mail Alert, Update Record, Create Record, and Call URL. A typical company has a very complex business structure, requiring a large amount of related tables, holding a large number of records. An online system that the company utilized years ago seemed to be suitable; however, as the business grew substantially over the years, a company finds their database expenses skyrocketing as their vendor pricing scheme depends on data volume. As the database complexity has grown over years, the company is reluctant to switch to a new vendor, realising potential conversion difficulties. TeamDesk provides an unlimited storage and allows an unlimited database complexity at no extra cost, while keeping stable rates and a straightforward pricing model for a decade. Moreover, TeamDesk provides a free database migration service to help companies migrate their databases to the TeamDesk platform. Each enterprise has different requirements and requires a system that can be personalized for their size, type of workers and buyers, and the specific industry they are in. For these reasons, no system can proffer perfect tools out-of-the-box. When you search a software app, first be sure what you want it for. Read some TeamDesk reviews and ask yourself do you desire basic tools or do you need sophisticated tools? Are there any industry-specific tools that you are seeking? Find the answers to these questions to assist your search. There are plenty of aspects that you need to mull over and these include your budget, specific business wants, your company size, integration requirements etc. Take your time, check out a few free trials, and finally choose the platform that provides all that you require to enhance your company efficiency and productivity. How Much Does TeamDesk Cost? We realize that when you make a decision to buy IT Management Software it’s important not only to see how experts evaluate it in their reviews, but also to find out if the real people and companies that buy it are actually satisfied with the product. That’s why we’ve created our behavior-based Customer Satisfaction Algorithm™ that gathers customer reviews, comments and TeamDesk reviews across a wide range of social media sites. The data is then presented in an easy to digest form showing how many people had positive and negative experience with TeamDesk. With that information at hand you should be equipped to make an informed buying decision that you won’t regret. What are TeamDesk pricing details? What integrations are available for TeamDesk? TeamDesk supports API interface, so it may be integrated with any system, supporting API. TeamDesk also supports email interface, so it may retrieve and parse email notifications generated by other systems, providing an additional way of integration if API is not suitable. Furthermore, the SMS sending functionality can be integrated via Call-URL workflow action. If you need more information about TeamDesk or you simply have a question let us know what you need and we’ll forward your request directly to the vendor.